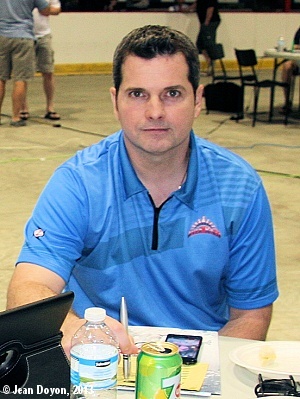 Already dealing with a blockbuster trade that sent one of their fan favourites in Mario Joly to the Valleyfield Braves, the Cornwall River Kings were dealt yet another blow today as it was announced that interim coach Jean Francois Labbe has resigned. You can’t really blame the guy for leaving. Yes, he would’ve been an integral help to Cornwall’s second LNAH season but a pay raise and a chance to work close to family is an offer that nobody in their right mind would turn down. This has nothing to do with internal politics. Winning the Calder Cup with Hersey. Labbe has had enough time in the spotlight with a very lengthy goaltending career. After completing his junior years in the QMJHL he went on star in the AHL with the Cornwall Aces, Hartford Wolf Pack and Syracuse Crunch among others. He even had minor stints with the New York Rangers and Columbus Blue Jackets. With no North American teams calling his name, he headed over to Europe and played in the German Elite League and in Austria. Last season, Labbe started his coaching career in the LNAH with Trois Rivieres. The hunt is on for the next coach of the Cornwall River King. They better have a few in mind as training camp and exhibition games are slated to get started soon.